Whorl Console, designed and made by Neal Aronowitz, was the winner of the 2017 Gray Award for Product Design in the Furniture/Lighting category. The judges included Philippe Starck, Karim Rashid and Ingo Maurer. 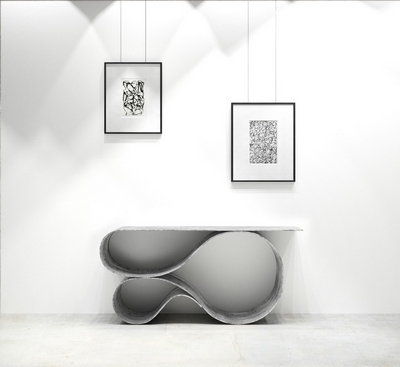 The innovative console table is made of Concrete Canvas, a patented concrete-impregnated fabric rarely used in furniture design. 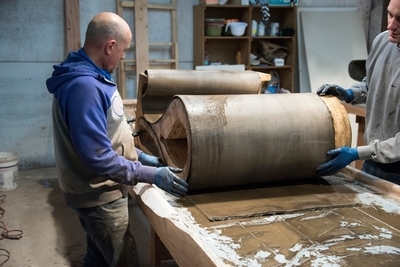 Concrete Canvas is a new material that allows concrete to be used in radically innovative ways. The flexible, concrete-impregnated fabric hardens on hydration to form a thin, durable, waterproof and fire-resistant concrete layer – in essence, it is concrete cloth on a roll. It has been used to make rapidly deployable shelters, particularly in disaster-relief situations, as well as for erosion control and ditch lining. It reduces the environmental impact of concrete applications by up to 95%. The challenge in the design and construction of this series was to stretch the tensile strength of the material to its limits for aesthetic beauty and interest, seemingly defying gravity. At the same time, each piece needs to maintain its structural integrity as a utilitarian object intended for everyday use. 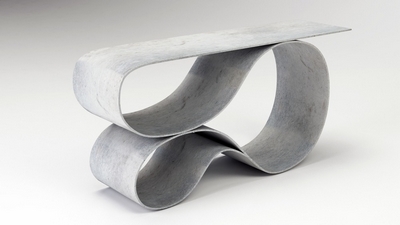 Aronowitz developed new casting and forming techniques to achieve the table’s ribbon-like structure. The surface consists of pigmented cement mortar lightly skim-coated over the entire surface and sanded to a very smooth, highly polished finish. Designed and fabricated by Neal Aronowitz Studio. Concrete Canvas Series. Open edition. Materials: Concrete Canvas, cement mortar, custom cement pigments. Dimensions: 63” long x 17” wide x 30” high; 170 cm long x 43 cm wide x 76 cm high. Size can be modified. Neal Aronowitz is a Brooklyn native who now lives in Portland, Oregon. In 2015 he opened his studio, devoted to creating bespoke sculptural furniture and lighting. The Whorl Table, a coffee table in the Whorl Concrete Canvas Series, won the 2017 Azure Magazine People’s Choice Award for Furniture and Lighting. His first lighting design, the Boro Boro Chandelier, was a runner-up at the 2016 LAMP International Lighting Competition.